Well, he has done it again. The interwebs is abuzz with celebration and concern that Pope Francis is changing the Church yet again. He has given an exclusive interview for use in several Jesuit publications, the US one being America Magazine. 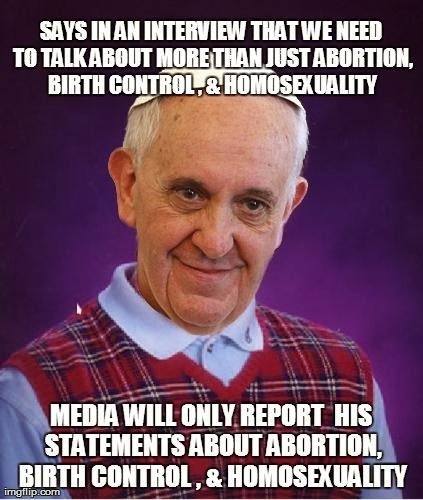 He has covered a wide breadth of issues, but all we have heard is that the Pope has told us to stop picking on homosexuals and focusing on abortion. Those outside the Church (and some inside) act as though this is big news. The problem is that it is not new. He is spot on. Most Catholics I know are all "Right on, Papa!" The trouble is that the media only wants to focus on these issues. While we could simply go down the road of pointing fingers at the MSM, as I was reflecting on why we are in a tizzy again, I realized something. The reason Papa Francesco's words about these issues are striking a chord is that in many cases he is absolutely right that this is what the Church in the west (at least in the US) has become known for advocating. This in itself is a failing indeed. Sadly, we are trapped in a bit of a catch-22 here. We have to proclaim the truth about these issues because they have become the face of "justice" for the MSM and society at large. "Marriage equality" and "reproductive rights" are the banner behind which the loudest voices march, and as beacons of light and Truth, we have to stand apart and preach. However, and this is a big however, we have to find a way to get back on the offensive where we are proactively preaching a Gospel that is overflowing with love and mercy in a way that people can recognize it, in a way that transforms the people around us. If that isn't what is synonymous with Christian discipleship, with the Catholic Church, then all the moral certitude in the world is for naught. I've already unleashed my manifesto on this, so instead, I'll bring you highlights of all the things this momentous interview actually covered. Pope Francis is gonna be a problem for us all, the way Jesus was a problem, I think. If you ask me, that's a mighty fine problem to have as a Church. "Three things in particular struck me about the Society: the missionary spirit, community and discipline." “Discernment,” he replies. “Discernment is one of the things that worked inside St. Ignatius. For him it is an instrument of struggle in order to know the Lord and follow him more closely." "So now, more than ever, the Society of Jesus must be contemplative in action, must live a profound closeness to the whole church as both the ‘people of God’ and ‘holy mother the hierarchical church.’"
"We must be very careful not to think that this infallibilitas of all the faithful I am talking about in the light of Vatican II is a form of populism. No; it is the experience of ‘holy mother the hierarchical church,’ as St. Ignatius called it, the church as the people of God, pastors and people together. The church is the totality of God’s people." 'For me, the relationship between the ancient Catholic churches and the young ones is similar to the relationship between young and elderly people in a society. They build the future, the young ones with their strength and the others with their wisdom." “I see clearly,” the pope continues, “that the thing the church needs most today is the ability to heal wounds and to warm the hearts of the faithful; it needs nearness, proximity. I see the church as a field hospital after battle. It is useless to ask a seriously injured person if he has high cholesterol and about the level of his blood sugars! You have to heal his wounds. Then we can talk about everything else. Heal the wounds, heal the wounds.... And you have to start from the ground up...The proclamation of the saving love of God comes before moral and religious imperatives." “We must walk together: the people, the bishops and the pope. Synodality should be lived at various levels." “I am wary of a solution that can be reduced to a kind of ‘female machismo,’ because a woman has a different make-up than a man. But what I hear about the role of women is often inspired by an ideology of machismo. Women are asking deep questions that must be addressed. The church cannot be herself without the woman and her role. The woman is essential for the church." 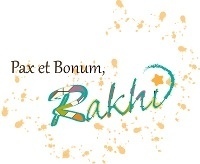 “Vatican II produced a renewal movement that simply comes from the same Gospel. Its fruits are enormous." “Finding God in all things is not an ‘empirical eureka.’ When we desire to encounter God, we would like to verify him immediately by an empirical method. But you cannot meet God this way. God is found in the gentle breeze perceived by Elijah." If one has the answers to all the questions—that is the proof that God is not with him. It means that he is a false prophet using religion for himself. The great leaders of the people of God, like Moses, have always left room for doubt. You must leave room for the Lord, not for our certainties; we must be humble." Yeah, I think this Pope is going to challenge all of us to the core, whether we are "traditionalists" or "progressives," whatever our banner and call, he will challenge us to go deeper and stretch wider to the ends of the earth in the name and likeness of Jesus. Continually. Always. It's gonna be a great problem. I encourage you to read the full text of the interview at America Magazine - it will be well worth your time, I promise.